"Oh how nice it would be to spend time with love ones"
Everyone talks about the convenience to shop on Sunday but what about the convenience to see your doctor on Sat. or Sun. Or getting mail on Sat. or Sun. or going for a loan on Sat. or Sun. Or getting your car fix on Sat. or Sun. Which are just as essential as shopping. You ask how is it well if your sick you can't shop. If your car breaks down you can't shop and you may need a loan to shop. 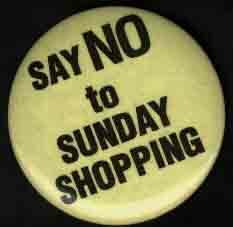 People want Sunday Shopping and they say it's because they don't have enough time. Lets think about this most of you probably work at a job 9-5 or there a bouts and most stores are open till 9 at night or later. You say you don't have time come on now THAT'S 4 hrs or more after you get off. I think it's because your bore and you have nothing better to do but to make our lives more upsetting. I don't hear anyone complaining about not able to see your doctor or going for a loan at a bank or getting your car fix. These places are open less hours than the stores and are open only 5 days a week. So if you have time to do one of these then you sure have time to shop in 6 days. Why should we work and not you get service from you on Sunday. If a holiday lands on a Saturday you get an extra day but we don't and we are even open on some Holidays I don't see you working on them. So Sunday shopping shouldn't even be an issue to begin with, when the other services aren't even open on Sat. Maybe people should fight to have these open first you don't hear people wine that they can't see their doctor or get their car fix or go for a loan at the bank or get mail on Saturday or Sunday why oh why I don't know. But t hey want Sunday Shopping it doesn't make sense. Retail workers across this globe we must unionize and stamp out this kind of discrimination. Remember there is a light at the end of the tunnel. What's this world coming to that people have to shop on Sunday? You must lead a boring life.Can't you go visiting or stay home and watch TV or play a game. Who is it that actually wants this? It's the people that wouldn't have to work. If you had to work Sunday would you? "Stop being selfish and think about other people we to have a family." It's hard to believe that in this day and age discrimination still exists in our society's as we move into the year 2000 our rights as retail workers are being taken away from us if not already. We are not saying if you work in another line of work on Sunday that it is right but you had a choice. We all must stand together and fight for what is right. By opening these large stores on Sunday they will hurt the small corner stores and many will have to close their doors for good. Then all those extra tax dollars the government things they can make will be spent on Unemployment Insurance. Think about this one if you had a better half and one of you had to work on Sunday when would you have time to spend with them or your kids? We also have families so don't take away the only day that we can count on to spend with our love ones. Some people say oh I work for the extra money but you are just as greedy as the giant chains. What if they weren't going to pay extra would you work? The answer is probably NO. Others say oh if it happens it happens sure it's going to happen if you don't speak up and say NO we don't want this. Where will the flea markets go they will be a thing of the pass. If you answer NO to any of the following questions then we strongly feel you should stand behind us and support us before your rights are taken away from you. What is this world coming to that they have to shop on Sunday? Can't they go visiting or stay home and watch TV or play a game? Who actually wants this? Its the people that don't have to work! If you had to work on Sundays, would you want it? You must lead a boring life? Can I see my doctor on a Sunday? Can I get my car fix on a Sunday? Can I go to the bank for a loan on a Sunday? Can I go to the liquor store on Sunday? Can I get mail on Sunday? Can I go to the Post Office on Sunday? Can I call a government official at his office on Sunday? The list goes on and on, so why is the retail sector being discriminated against? If it is good for one then it should be good for everyone else. Give us a break, its the only day we can count on having off. The BUCK must stop here. We all must fight for what is right.